Vivian Creamier began writing professionally in 2007. She has written for websites such as Covermom. Primarily she writes about home and health topics such as kids, cooking, weight loss and acne. Creamier attended the University of Phoenix and studied education. If you are considering a fast to lose weight, a fruit diet may be a beneficial option. Unlike water or juice fasts, the fruit diet allows you to eat whole fruits, rather than just liquids. Your metabolism is left intact when on the fruit diet, rather than slowing down the way it does with liquid diets. According to Diet.com, a fruit diet is a fast in which you ingest only fresh, raw fruits. It has the same effects as other fasts. It cleanses toxins that have been stored inside your body. The fruit diet can be used for weight loss and detoxification. Freedomyou.com advises against using the fruit diet for extended periods of time, because the diet does not give you needed nutrients. You will feel hungry for the first few days after you start the fruit diet. This is due to the drastic reduction in the calories you are consuming. According to Diet.com, this hunger is a good sign because it is signaling that your body is using fat reserves for energy. This can cause more weight loss. There are several benefits to choosing a fruit diet fast, rather than fasting with water or juice. According to Freedomyou, you consume fewer calories on a fruit diet fast, compared to a fruit juice fast. This results in a deeper detoxification and better weight loss. Your digestive system stays active during a fruit diet, unlike juice or water fasts. This keeps your metabolism from dropping, which occurs naturally with liquid fasts to save energy, says Freedomyou. 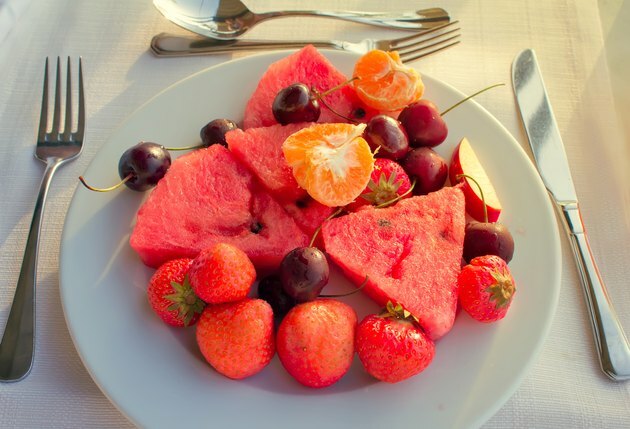 With a normal rate of metabolism and less calorie intake, a fruit diet promotes detoxification and safe weight loss. As a side effect of the cleansing effect of fruit and toxins being released, you may notice that you have foul breath. You will begin to feel weakness and a loss of muscle strength over longer periods of time. More seriously, you lose important nutrients that you would otherwise get eating a balanced diet, according to Freedomyou. Freedomyou says critics believe that the fruit diet is dangerous to your health because it does not provide a sufficient amount of nutrients. There is also speculation about whether the plan really promotes weight loss. Critics believe that the weight you lose on the diet is water weight, rather than fat loss.